Bob Plunket shares highlights—and lowlights—of the market this year. 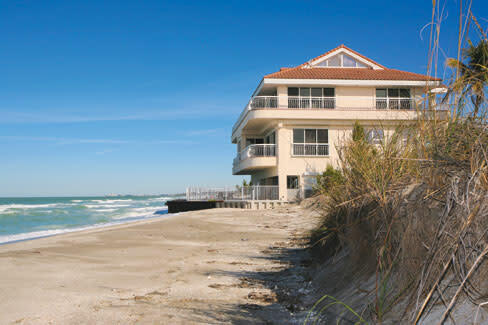 It's been a busy year in Sarasota real estate, with the recession easing and sales picking up considerably. The big problem now? Not enough houses for sale. And what does come on the market often goes immediately, and for cash. The three most expensive homes currently on the market? Here they are, in order of price. A three-house compound set on the fanciest stretch of Casey Key, right near where Stephen King lives. Three hundred feet of beachfront. Also faces the bay. Two boat docks and a tennis court. Rumored to have once belonged to the Gotti family. Been on the market for three years; reduced about $5 million during that time. Time to make an offer they can't refuse. The Githler house. Built in 2005 by a youngish couple, now divorced, who made a fortune during the boom. Almost 11,000 square feet, beautifully done in a traditional style. Located near the Ringling Museum. The house was an obligatory stop for every Republican bigwig passing through town. 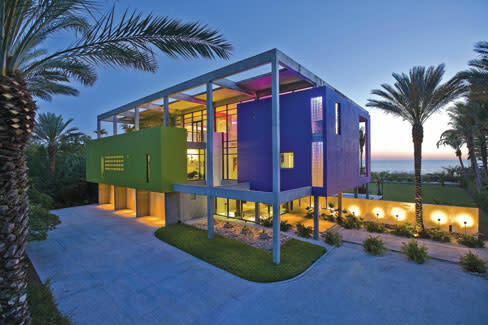 Dramatic, modernistic showplace in the gated Sanderling Club on Siesta Key. Designed by Guy Peterson, very much the architect of the moment. Over 1.5 acres of beachfront. Resort-type feeling. Splashy, colorful interior. Been on the market more than two years. These three homes are like nothing else in town. The home of Chick Austin, the first director of the Ringling Museum. 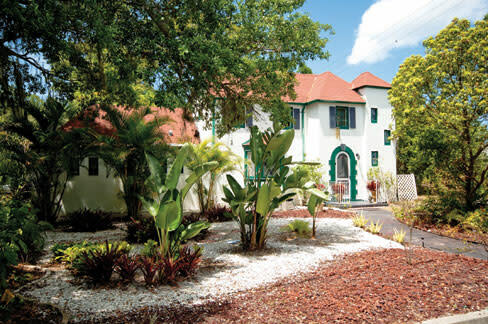 In Sarasota's heyday as an artist's colony, this was the most glamorous house in town. The dapper Mr. Austin, known as the man who brought modern art to America, entertained Bette Davis and Prince Rainier in the full-sized ballroom. The current owner has done a great job of remodeling and updating. An elegant, over-the-top house that's full of surprises, including gorgeous landscaping, a guest house, and a tri-level tree house overlooking the Whitfield neighborhood. One of the famous "midget houses" that have charmed the town since they were built in the 1920s. No, contrary to popular legend, John Ringling didn't build them for his favorite midgets, and, yes, they're full-size inside. Much of the interior is original, and the whimsy factor is off the charts—pecky cypress, beamed ceilings, leaded glass windows, built-in vanities. But this 1,700-square-foot home is sunny and very livable. Perfectly located in the arty museum area. Said to have treasure hidden in the walls. Realtor Pat Taylor has owned this local landmark in Indian Beach for 35 years. 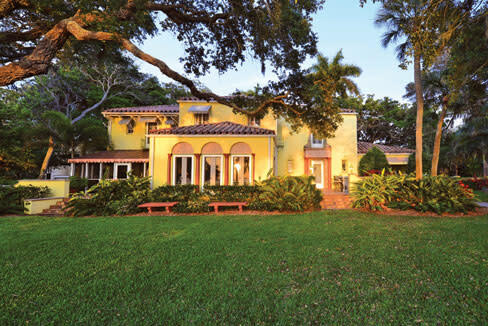 Built by the famous Whitfield family, it may well be Sarasota's prettiest 1920s house. The interior has been beautifully maintained and updated, with wood floors, fireplaces, columns, tiles, etc. Beautifully landscaped with ancient oak trees, it looks out over the bay to Longboat. Listed on the National Register of Historic Places. SO YOU WANT A SARASOTA SCHOOL HOUSE? Don't worry. There's always a couple of these mid-century architectural gems on the market. But keep in mind the good ones go quickly if they're well priced. Here are some currently available. The famous Cooney house is one of architect Tim Siebert's best. Built in 1967, it's got four bedrooms, three baths, and great mid-century modern spaces, with all its integrity still intact. A great location, just a short walk from St. Armands Circle. This is the one that will most impress your fellow architect freaks. This is an interesting Siesta Key house from 1956, designed by Ralph Twitchell, one of the founders of the Sarasota School. Mostly original, with intact period bathrooms and a wonderful two-story grid façade. The home could use some updating and fine tuning, but if you're looking for a project, here it is. Comes complete with pool and boat dock on a canal. 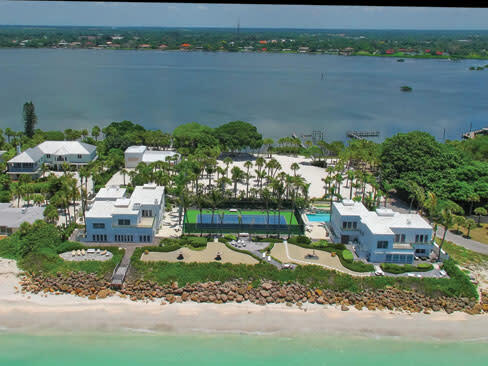 Built in 2002, this 4,000-square-foot waterfront home is a little too new and elaborate to be real Sarasota School, but it's by one of the town's modern architecture masters (Carl Abbott) and the aesthetic is cool and modern. There's a two-story living room and a beautiful pool overlooking the Intracoastal Waterway. And keep in mind…There are several condo complexes designed by Frank Folsom Smith where you can get the Sarasota School look and feel without an enormous expenditure. 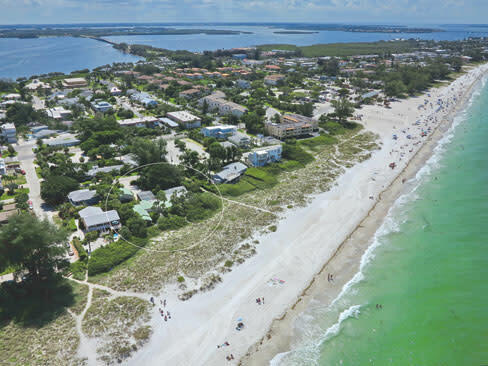 Check out Sandy Cove (from the late 1970s) on Siesta Key, where there are a wide variety of floor plans with lots of glass, vaulted ceilings, atriums and other late mid-century touches. The place attracts a lot of arty residents and the grounds are sprawling, with several small lakes and a private beach. Smaller units start in the low $200s. And there's Pine Run down in Osprey. Also by Folsom Smith, and in the same general style, this place is a real bargain. There's currently a two-bedroom, two-bath, 1,300-square-foot unit for sale for just $109,900. From the outside, the villas of Glen Oaks Manor are not much to look at—bland and boxy, with a single window facing the street. But inside they open up into a terrific 1,800-square-foot floor plan built around a totally enclosed patio. Most have a pool that's perfect for skinny dipping. These villas are runaway favorites with the town's interior decorators (hence the nickname "Glitter Gulch"). Many are decorated within an inch of their lives, and the competition can get pretty fierce. The secret? The interior is infinitely adaptable to a million different styles, and can be given a luxurious gloss unusual in this price range. An unremodeled unit will start around $175,000. The beautifully gussied-up example below is listed at $279,000. What "affordable housing" crisis? Even ultra-pricey Longboat Key has its bargains—you just have to look around. 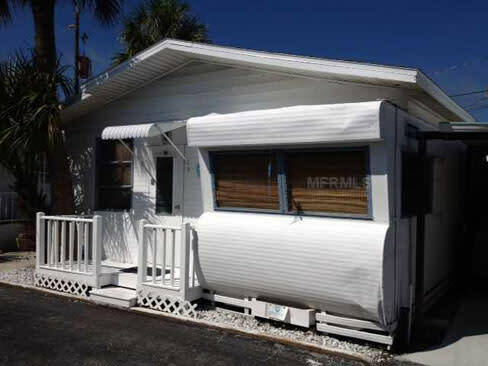 Here's a 500-square-foot mobile home located in that cute complex mid-key, with deeded beach access, fishing pier and boat slips, all for $64,900. Is this 7,800-square-foot mansion at the southern tip of Siesta Key the inspiration for "Big Pink," the mysterious beach home that's the setting for the Stephen King classic thriller Duma Key? They're both perched dramatically at the Gulf's edge, they're both pink, and the real house is visible from King's winter quarters, a short stroll south to Casey Key. When King wrote the novel in 2008, the real Big Pink was in a state of spooky disrepair. 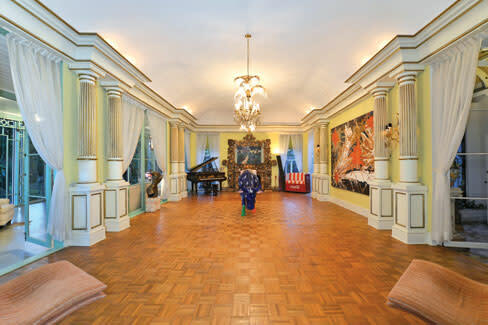 It's now been nicely renovated and is on the market for a goosebump-inducing $10.2 million. It sounds like the setup for a Hollywood comedy. 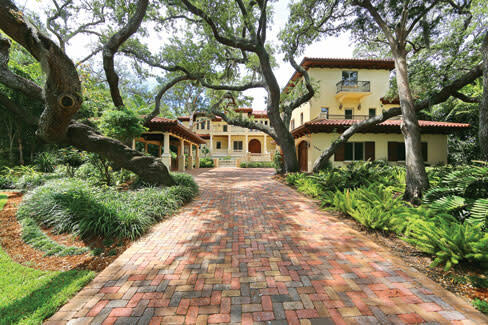 An unassuming retired couple in their 60s from tiny Red Bud, Ill., wins the Powerball and buys a $7.5 million dollar mansion on Sarasota's most exclusive street. But that's exactly what happened back in December when Merle and Patricia Butler bought this 8,500-square-foot Mediterranean Revival on Hillview Avenue. It was the largest residential sale of 2012. Judging from Facebook posts, our coverage of the sale, plus pictures, created quite a stir among the Butlers' neighbors back home. Some were delighted, others were green with envy. One thing is certain—for a week or so, Real Estate Junkie was the talk of Red Bud. Here's an example of how quickly the good stuff goes these days. This Holmes Beach beauty was sold the minute it went on the market. And understandably so—it personifies the old-fashioned charm of the Gulf coast before the McMansions took over. Built in 1936 and still in perfect shape, it has big, gracious rooms, wood floors and paneled wall, a pool and a killer view out over the dunes to the water. The asking price was $1,975,000. Pictures sell real estate. Except maybe for these--some recent photos from the Multiple Listing Service.